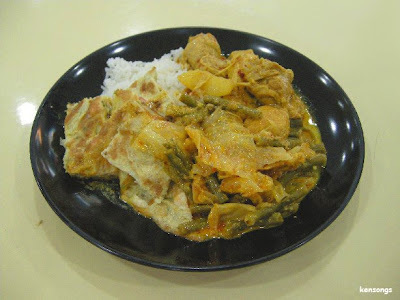 Every time I smell the scent of Chinese curry vegetables or just see a dish of rice with curry vegetables and fried chicken drumstick, I am transported back immediately to my primary school days. Normally, in primary school, I wouldn't stay in school for lunch. I'd either eat before school (when I was in the afternoon session) or when I returned home later (when in the morning session). But in Primary 6, every Friday, my class would stay back for remedial lessons. I think it was to cram for the year-end PSLE exams, though I don't remember the actual reason. What I do remember is that, at lunch time, almost all of us would make a bee-line for the only economic rice stall in the canteen. And it was always for the same dish: white rice with curry vegetables and friend chicken. The curry vegetables were the best thing I had ever tasted then. Not too spicy that most chilli-mad Singaporeans would crave, but not too mild that it was uninteresting to the tastebuds. And the fried chicken was, well, friend chicken. You can't really go wrong with fried chicken. But there was one more "trick" to get the ultimate dish. It was to be served by the young girl. No, it wasn't because we young boys had a hormonal crush on her. We would all queue up in one line and hope and pray that when it came to our turn, the young girl would be free, instead of the other older stallholder (whom we thought was her mum). And if luck was upon us and the young girl served us, then we would be very happy because... she always gave the freshest fried chicken! She'd pick the pieces that had just been freshly fried, so that they would still be crispy and crunchy. If the other stallholder served us, she would pick the pieces of chicken that had been lying out for a while, and these would be softer and somehow, more bland. To this day, I still remember that dish of economic rice. And I would also smile at the memory of how we preferred being served by the young girl so that the delicious dish was made even more yummy!